Program may change from advertised at short notice. Every effort is made to keep it up to date, but always listen at cubs the week before an event to check. 8 years to 10½ years old. The Cub Scouts meet on a Thursday from 18:30 to 20:00. The Cub Scout Leader is Jack Monk. This camp celebrated 100 years of Cub Scouting with the theme being ‘Sports and Games from the past 100 years’. There was a variety of activities based on this theme for the Cubs to enjoy on both the Saturday and Sunday with a Birthday Party held on the Saturday evening complete with party games and birthday cake. All in all an excellent camp. This afternoon at Horley camp site was enjoyed by a dozen Cubs who were able to do a mixture of indoor and outdoor activities which included ‘fishing for ducks’ and making peg butterflies indoors then outdoors in the woods building bivouacs, blindfolded following a string trail and hunting for chocolates. Everyone seemed to thoroughly enjoy the afternoon with some very tired looking Cubs greeting their parents at the end of the afternoon. Sixteen Cubs took part in the night hike which saw them hike a four mile route around Shutford on a dry still evening, and not too muddy underfoot. The hike was followed by a sleepover at Headquarters with parents picking up at 10.00 on the Sunday morning. Always a popular event, very enjoyable for both Cubs and Leaders and another chance for Cubs to work on the requirements of the ‘Outdoor Challenge’ badge. A special day out to acknowledge the extra responsibilities that Sixers and Seconders are given. Travelling by train, everyone had a wonderful time exploring what was on offer at Think Tank including a visit to the Planetarium and the outside Discovery Park. A fun filled and productive few hours at Horley Scout camp site on a cold crisp winter’s day for fifteen Cubs who thoroughly enjoyed lighting their fires and cooking various items on the fires. The Scout Association has declared 2015 to be the ‘Year of Adventure’ for Cub Scouts and are encouraging Packs to give their Cubs the opportunity to do more adventurous activities this year. As a Pack, we already do a lot of the suggestions that were on the recommended list but to give the more adventurous Cubs an opportunity to do something different, we arranged a day out at a High Ropes Course and invited our Scouts to join us. This event is quite popular with the Cubs and Leaders and has become an annual favourite. The Cubs are used to doing hiking and walks with the Pack in the daylight but it is nice to be able to give them the opportunity to walk in the dark, at the same time coping with winter weather. This year’s Challenge was subtitled ‘Egg Challenge’ as it involved constructing something on wheels that could carry an egg, with the aim being for the construction to be raced over a short distance without the egg falling out. The event was held in the Sports Hall of Cooper School at Bicester, which was an ideal venue for racing the constructions. In conjunction with Tesco’s ‘Eat Happy Project’ for Cubs and Beavers, which is a long term commitment by Tesco to help children have a healthier and happier relationship with food, we arranged our visit on one of our Pack evenings, to allow all Cubs to go. As we try to do each year, we organised a day just for our Sixers and Seconders as a thank you to them for carrying out their extra responsibilities within the Pack, including looking after their Six. This year we took three Sixers, four Seconders, one Young Leader and five Leaders to Leamington Spa Tenpin for an afternoon of tenpin bowling followed by tea at the Bowling Alley. Our joint Winter Camp with the scouts at The Quarries Scout Campsite, just outside Cosgrove near Milton Keynes. We camped indoors, and during the weekend the Cubs and Scouts enjoyed a full range of activities. Our Pack evenings in December were all Christmas related. Our afternoon out to Towcester Swimming Pool is always a popular trip with both the Cubs and the Cub Leaders. The Leaders who go into the pool with the Cubs always enjoy that as much as the Cubs! We decided to hold a Halloween Party again this year. 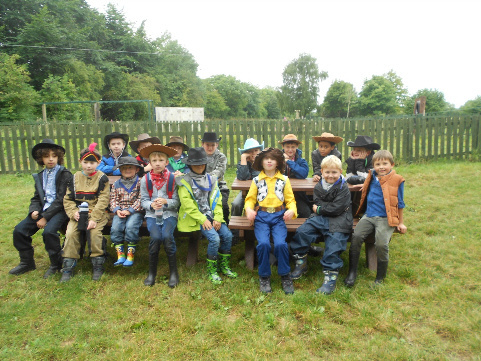 A wonderful action packed fun day out enjoyed by both Cubs and Leaders alike. Visit to the Lyndon Players production of Mother Goose at Middleton Cheney Village Hall. Oh yes we did!